Saito was fortunate to have spent more time training directly under the founder than any other person, either before or after the war. What distinguishes Saito's methods from those of his predecessors is his emphasis on taijutsu (empty-handed techniques), and aiki weapons, the ken (sword) and jo (staff). There are several reasons why these weapons are not universally practiced in the aikido world today. Only a few people were exposed to weapons training under the founder Ueshiba, and as a result the number of instructors qualified to teach these arts is rather limited. Saito's mastery of these weapons was gained during his long years of training under the founder in Iwama and the subsequent years of experimentation and refinement. 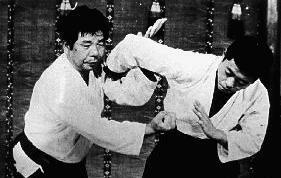 His technical system has become the de facto standard for aikido weapons practice all over the world. Training in the aiki ken and jo leads to a increased understanding of combative distance, positioning, and body centering. It develops good posture and strengthens the arms and shoulders which in turn aids in the execution of empty-handed techniques. Weapons training forms an integral part of Saito's curriculum and are perfect and necessary complement to training in empty-handed techniques. A ninth dan senior instructor of the Aikikai Headquarters School, one of only a handful of teachers to hold this prestigious rank, Saito has trained and taught for nearly fifty years in the Iwama Dojo of the founder where he first enrolled as a teenager. Since the early 1970's, he has hosted literally thousands of live-in students, mostly from abroad, who have spent from a few days to several years practicing in one of Japan's few remaining traditional dojos. The Iwama dojo of Morihiro Saito is unique in that it provides a marriage of the best of both the traditional and modern: a secluded setting for intensive training combined with a carefully-organized curriculum and modern teaching methods. After the unfortunate passing of Saito Sensei on 13th may 2002, presently, Saito Sensei's son Hitohiro Saito Sensei continues the founder's tradition and teaches Iwama-ryu Takemusu Aikido (traditional aikido) at "Iwama Aiki Shuren Dojo" and guard and maintain the Aiki Jinja (Aiki Shrine) which is near the Iwama Dojo.